Sorry for the long absence and laxity in posting but (insert excuse here). So, Caledonian Uprising 2012 has been and gone. Yes, the list is very low on troops but this list wins by stopping my opponent from scoring and with 6 Typhoons and the Terminators pouring fire on and a Land Raider full of Assault Terminators my opponent should be leaving them alone. I am afraid I'm crap with names and I'm not very good at battle reports so Ill write a brief synopsis of each game and how I did. If I have forgotten your name or got your army list wrong I apologise ahead of time. To be honest I felt bad this game, he had not played 40k since 2nd or 3rd edition I think and I almost tabled him by the end of turn 6. I had to help him with the rules, point out where had could get cover saves by moving cleverer. He also had appalling luck, nothing he did seemed to work for him, my assault terminators did for 10 marines, 2 5 man Terminator squads, Belial and his God Hammer. I lost only the cyclone Terminators in return. I made a MASSIVE mistake with this game, the fear of being lashed by the prince made me deploy very defensively and even deployed my Raider right at the back. Instead of dealing with the Prince early I poured fire into the oblits and did nothing. His dice were on fire, he made 15 5+ invulnerable saves on the oblits that game and it wasnt until I got the assault Termies into them I killed something, then he lashed them away and it rinsed and repeated, lash, plasma, lash , plasma .... 20-0 loss. very dissapointing, had I gone for the Prince early perhaps I could have scored a drawer from it. who knows. He played well and won. 1 x Venerable Dread with twin linked Lascannon. I thought this was going to be very very tight, he had as many shots as I did and his list was more resilient to Krak Missiles than mine. I got first turn and I got lucky, Las Cannon shot into the Termie on his left flank caused them to run off the board turn 1 and then turn 2 multi assault into the remaining 2 terminator squads and his marshal smashing them. His chump and the 8 man squad he was with took 50% casualties and ran. The terminators cleared up 3 of his small squads and I torrented the remaining one off the board. My Tank hunters killed his dread all by turn 4. Turn 5 saw me table him in good order. This guy got my sportsmanship points for the weekend, despite the utter thrashing I gave him he remained an absolute gentleman, pointing out where my units could do a bit more and reminding me of things I had forgotten. By the end of day one I was on 39/60 points and pleased with myself. I was not looking forward to this match up, not at all, Gary is an awesome player and I have played this army before at Blog Wars and barely scratched a draw against it. I had an edge however, his hangover....and as it turns out his appalling luck!!! The man of the match this game was the Marshal and shall tell you why. Gary deploys all but one of his units to slog on, Belial and his unit drop in front of my line scattering 2 inches towards me. I take a chance, move the landraider on 12 and deploy the Assault Termies and attempt the charge through cover, I needed a 5 and got it. Turn one combat, my Assault Terminators smash through the unit leaving Belial on his lonesome. Gary lost 7 or 8 terminators to massed fire over the next couple of turns. His dice were appalling, he failed loads of 2+ saves, couldn't kill my speeders, and generally had a terrible time of it. My Marshal spent 7 turns in assault, he killed 8 or 9 Terminators on his lonesome dying on the final turn to fearless wounds. Gary had one chance in the final turn to contest both my objectives but didn't manage to roll what was needed Truly Epic. At game end he had 2 Terminators remaining, I had 2 objectives to his 0. Win 18 - 2. The list looked a bit like a store friendly list so I was hopeful, Peter is a player well out of my league as the game played out it became apparent how outclassed I was. I won first turn and he reserved everything. He then proceeded over the next 6 turns to disassemble my army. It was horrible, nothing I did went to plan and the librarian had 2 of my troop units running off the board being escorted off by scout bikers by the end of turn 3. Mephiston didn't show up till turn 4 and there was nothing really for him to do. The only thing that stopped this being a 20-0 loss was the assault Terminators (again). I got them into mid field and began to smash through units. They did for a unit of scout bikers, 2 x 5 man Squads, a Rhino and they were still whittled down and Sgt Corbolio managed to finish the remainder of the squad off buy himself on the final assault phase. Throughout the game I was outplayed, out shot and out assaulted. I learnt loads from this game despite getting a thorough spanking. Loss 17 - 3. Overall I had a great tournament and enjoyed myself immensely I finished 18th out of 116 players which is my best big tournament result and won best Black Templars General and received a certificate and a £5.00 voucher for Maelstrom Games (there were only 3 of us). This is on my list of tournaments to attend next year, if you haven't been you should. Its well worth going to, competitive and very, very friendly its well run at good location with onsite food and drink at good prices. Next up Vapnartak...1k, 3 Games. Ill post the list over the next couple of days. So I've managed to get time in for a few games tomorrow with Brad from the Sons of Sanguinius blog. I have a couple of lists in mind to try. One is my assault Terminator heavy list and the other is a missile spam list. The assault list needs me to be very aggressive and I struggle with this, I tend to loose focus and sometimes and up going backwards with the unit letting my opponent decide how the game is played. The second list is a missile spam list, 3 x 5 termies with double cyclones and 3 x 2 Typhoons, it kicks out loads of missiles 12 of them tank hunting but it feels very gun line. Both lists have 3 x 5 man crusader squads in them, I know popular opinion is that I should run bigger squads but to be honest I just cant justify spending the points on probably the most disappointing unit in the codex, I only have the minimum because I have to. The lists win by stopping my denying my opponent the ability to score. I either shove a great big assault squad down their throat of blow them off the board with massed missile fire. 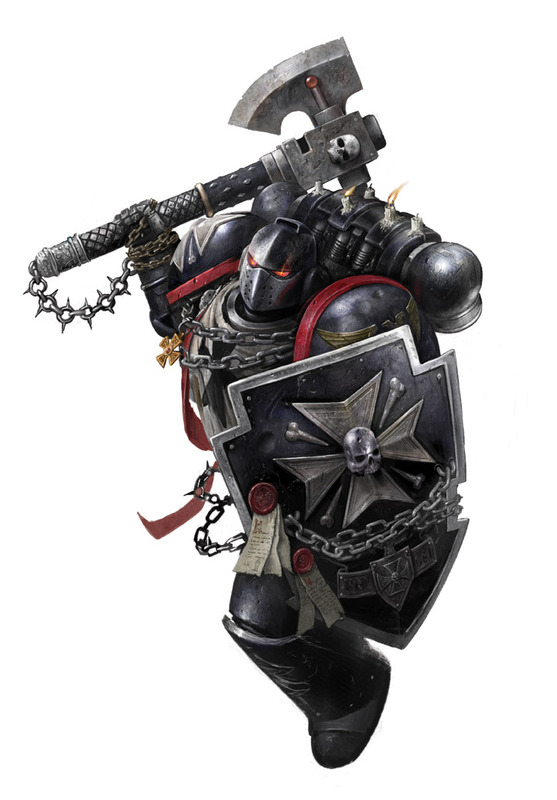 I am going to try a Chaplain with servitors, fearless and making me auto pass moral checks means the assault terminators automatically pass any zeal checks they need to make meaning the potential to roll on D6+3 after a casualty makes them an even bigger threat. Ill let post tomorrow letting you know know the lists got on and what I've decided on. As promised I thought I would through some more (better?) pictures up of the units I have painted for my Templar Army so far. I have had some very kind comments from those that have seen them in the "flesh". I painted the champion white so contrast him against the rest of the black army, it makes him stand out nicely as he is such a nice figure. As always, apologies as these were taken on my I-Phone. So, the list has to be submitted by the 22nd of December and after chewing the cud over with Brad and reading comments from Atradies, Venerable Brother and Killswitch Ive decided to go with the list bellow which I will be sending off tomorrow night unless I once again enter indecisive mode. HQ: Marshal, Lightning Claw, Storm Shield, Terminator Armour, Adamantine Mantle. HQ: Emperor's Champion, Accept Any Challenge. Elite: Sword Brethren Terminator Squad. 1 Terminator with Cyclone Missile Launcher, Chain fist. 1 Land Raider Crusader, Dozer Blade, Smoke Launchers, Blessed Hull. 8 Initiate with Bolt Pistol and CCW. 1 Initiate with Bolt Pistol & Power Weapon, Power Weapon. 5 Initiate with Bolt Pistol and CCW. 1 Neophyte with Bolt Pistol & CCW. 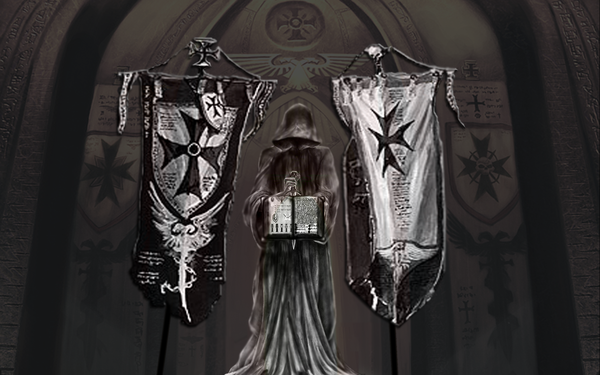 The main changes I've made are; Claw on the Marshal and some Neophytes to appease Venerable Brother. The Drop Pod squad means that I can dump a nice fat squad more or less anywhere I want to contest objectives, support the assault terminators or generally make a nuisance of themselves. Its nice and flexible and gives me some nice options and the Drop Squad means I can react to threats and the fact it drops in means my opponent will have to think about thier more static units deployment. So I've been having some thoughts about my caladonian list and I have been thinking about some alternatives and this is what I've come up with so far. That lot comes out at 1809 points and I have no idea where I might spend the remaining 41. My problem with this list is that it doesn't have a massive assault presence, I doesnt present a huge ranged threat, I think it might be a balanced list!!! Disclaimer: This web site is completely unofficial and in no way endorsed by Games Workshop Limited. Awesome Inc. theme. Powered by Blogger.